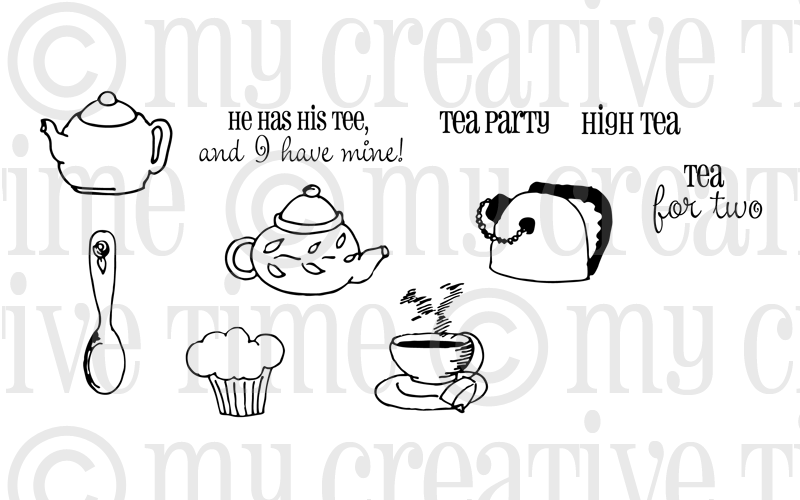 Welcome to Day One of the My Creative Time March Sneak Peeks! Emma is doing something a little different this month. You can actually order the new stamps sets in her store now! You'll want to do so quickly, because she has something fun up her sleeve for everybody on Friday! For my project, I made a tea dispenser. I've been dying to make one of these ever since I saw the one my friend Linda created on The Paper Boutique. Linda is so talented; she actually created this design, and with her video instructions I was able to make one quite easily. I didn't even need my die-cut machines to make this box! Click here for her awesome tutorial. 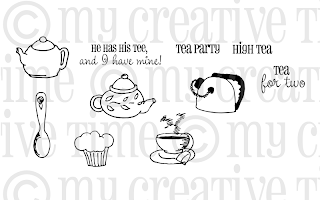 To decorate my box, I got to use My Creative Time's new Tea Party stamp set. 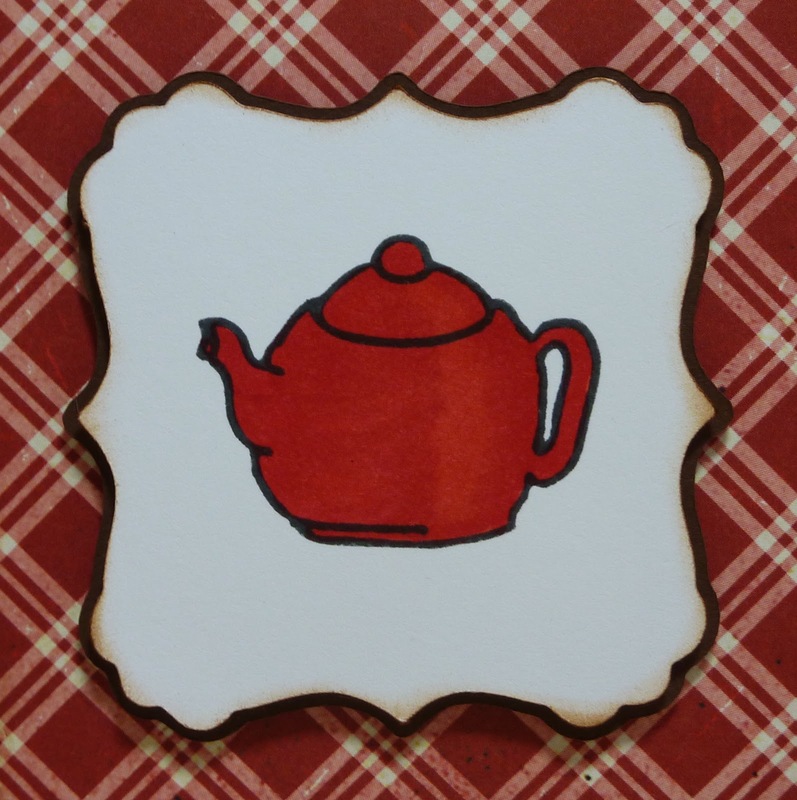 Among other images, there are three adorable tea pots! I colored each one with red Copics. To frame my tea pots, I cut this pretty shape and its shadow from the Cricut Elegant Edges cartridge at 2 1/4". I cut the oblong shape at 3". The adorable sentiment is also from Tea Party. This is my favorite image, so it's on the front of the tea dispenser. Emma will randomly pick and announce all winners on Friday, March 16th, during the blog hop release happening at 12:01 PST in her video! Good luck!!! Log onto your Facebook now and start spreading the word. AND, don't forget to stop by My Creative Time to see awesome projects created by Emma and the rest of the design team! Very clever and cute idea! Thanks for sharing. It's like you read my mind! This is such a cool idea for Valentines, Mother's Day, or even a Christmas gift for a co-worker. Love it! Katie ~ Are you kidding me! This is just AMAZING! I LOVE the box! What a GREAT idea! The images are to PERFECT too ~ your coloring is FABULOUS! I am in LOVE with this! GREAT JOB sweet friend! I am so lifting this! Thanks for the link to Linda's blog too ~ VERY sweet! OMG!! 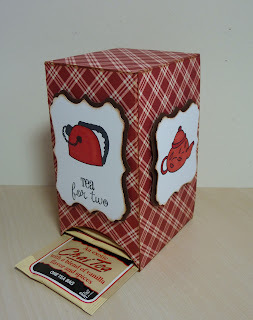 !what a clever idea with the box for the tea/label..great job!!! How cool is your project..love it!! such a prefect project for this awesome new release!! TFS your beautiful work!! How clever! I love the colors and the finished box looks great! Great idea. Love your blog thank you for sharing. I love the Tea Box. I could use one in the office. Really nice use of the TeaPots. 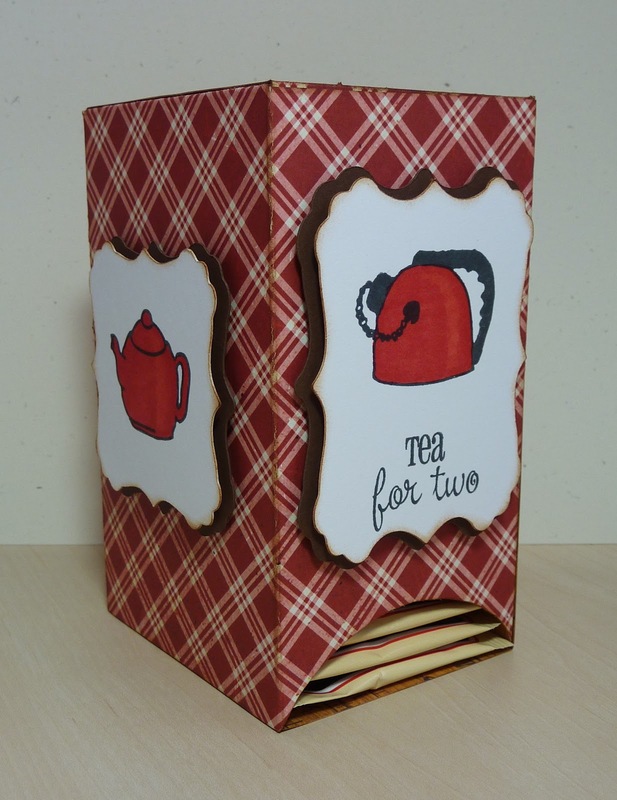 Great little tea dispenser box. This would make a nice little gift for anyone - even a teacher! Thanks Katie for mentioning me! I am so glad you liked the box and love how you decorated it. Wow! Wow, this is beautiful!!! I am going to try making one of these. What a cute gift. I am in love with all the sets of the new release, can't wait to have them with me. this is so awesome, love it!!! WOW,Katie! I love this project!! You did an awesome job on it! I love the papers! Your project is super cute! What a cute way to store your tea bags! Thanks for sharing! How cute is your tea dispenser?!! 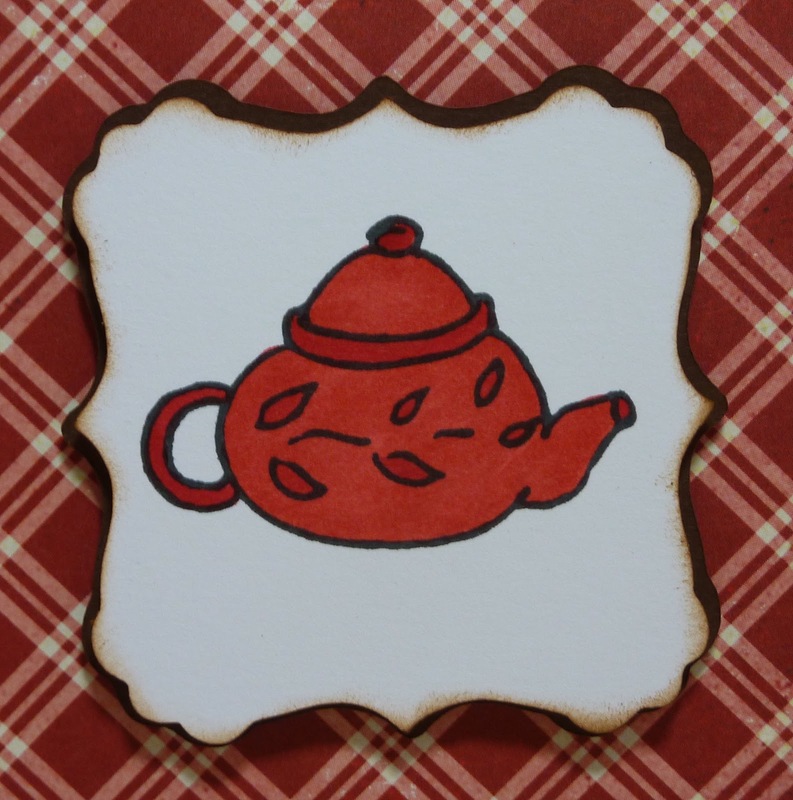 I love that paper you used, and the teapots are just to stinkin' cute! Katie, What a neat idea, TFS the link and the inspiration for this! Love the colors. Love it....Sooo cute!! I also saw this on Lindas blog...very clever!! What a pretty way to keep tea on the counter. Thanks so much for the link to learn how to make the box. Yours looks so pretty. Thanks for sharing. A very cute idea. Great project! You will want to leave this on the counter. Wow Katie your friend Linda is very creative. Love the colors and a perfect way to use the new stamp set for tea time. 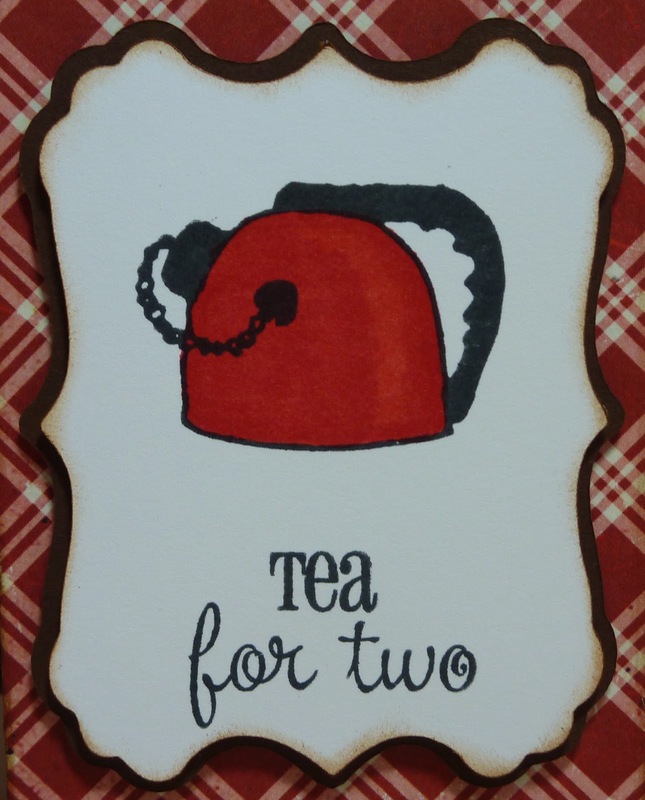 I have two great friends who drink tea and this would be great gifts for a birthday or Christmas. I would love to try this. Thanks for sharing AJ! Great project Thanks for sharing the video link. The teapots are great on this stamp set. Love the red plaid box. Hi katie, I love your tea dispenser, thanks for sharing. Great project idea! It turned out really cute. Thank you for sharing. Very cute tea bag dispenser! Super duper cute. I'll definitely be making one of these cute tea bag holders. Thanks for the inspiration. What a great idea..you did such a great job with it! This would be such a neat little gift for a friend who is under the weather...great job!! Wow! I need to make one of these boxes now! Cute idea to have your teas so handy. I love that red color and those cute images. Awesome!! Love how you have created a tea bag dispenser with these stamps. Fab job!! This is a great project. Love the use of the stamps. Great idea for a tea dispenser! TFS! When this idea was 1st posted I attempted to try it. I ended up with a mess. It didn't work for me but have been wanting to try again. Yours turned out so cute. Oh my, what a perfect way to use this stamps set! Simply adorable! Such a pretty tea box. I need to make one of these for my friend who loves tea. Thanks for sharing. Can't wait to get my stamps and start creating one. What a great idea. So much more attractive then the regular box.I just love it. LOVE it - what a perfect little idea. Great job with the tea box.